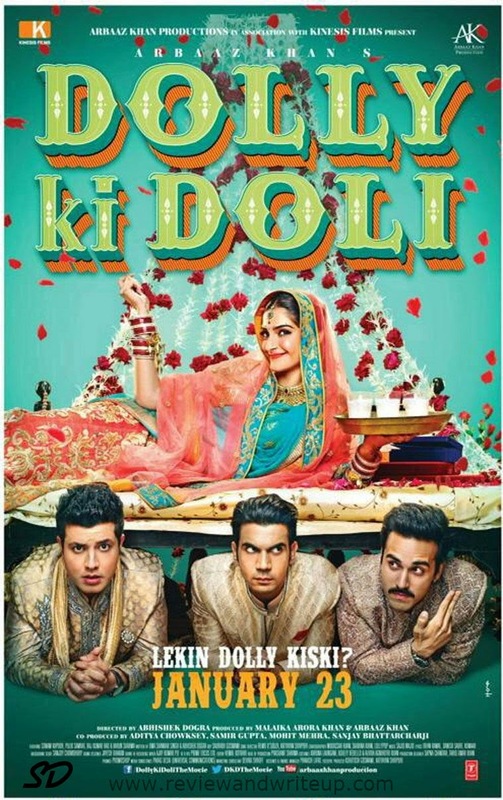 Dolly Ki Doli is a commercial romantic and comedy film. The film has been directed by debutant director Abhishek Dogra under Arbaaz Khan Productions. With so many new directors coming I expect them to bring some fresh stories. R&W Review: Trailer begins with Rajkumar Rao waking up and calling out name of his wife Dolly. The film is about a bride (Looteri Dulhan) who escapes in the morning along with whatever things she can steal from the house. She marries only to rob the men. Sonam Kapoor is playing conwoman in the film. Sonam shows up in vibrant looks in the trailer. She definitely stands out in the trailer. What I feel missing is that every attempt has been made to make actress look prettier. More than pretty one must look like the character he/she is playing. Remember Vidya Balan in Bobby Jasoos where she experimented with various looks. She looked hideous like her characters in the film. A TV reporter announcing news about Looteri Dulhan sounds funny. Ohh its gonna be fun to watch Varun Sharma again. I really enjoyed his acting in Fukrey. Rajkumar Rao I guess for the first time will be seen playing a comic role. He had been known for his serious roles. Trailer does tickle, but after watching whole trailer I felt like I have seen something like this before. It doesn’t sound so fresh. Also for so many comedy films all punches of the film are already shown in the trailer and in movie we are not able to find anything to laugh. I mean that’s the only funny part they have. I hope that should not be the case with this film. The film should have strong plot and please I don’t want to see any emotional drama in second half as normally happens with some Bollywood films. Music is composed by Sajid-Wajid and so far I didn’t like any. I hope film turns out well like the trailer is or may be more than that. Movie is scheduled to release on January 23rd, long Republic Day weekend. Good luck to the team DKD. R&W Recommendation: It will be good timepass. I am also planning to go. How about you? Let me know what you think about the trailer in the comments section below.